This weekend we went to Lake Arrowhead with my dad and his girlfriend, and her family. Lake Arrowhead is a really beautiful area, we had never been there before. While we were there Ethan grabbed a banana off the counter and said, nana, I had no idea that he knew that word. It was really cute. Another new word this week is bottle. He rolls his tongue on the ‘t’s’. I mentioned his comprehension in my last post, it’s getting better and better by the day. Jarrod hid a fish under the couch that Ethan had been playing with that was really small. He mentioned to me that the fish was under the couch and the next thing we knew, Ethan was on hands and knees looking for it under there. I guess we’re going to have to be really careful about what we say now. I mentioned that he had been somersaulting from the back of the couch onto the couch. Today the little daredevil climbed up to the top of the couch and jumped off the back onto the ground. Luckily Jarrod was able to catch him. Hopefully he doesn’t try that again when we’re not around to catch him! We have taken Ethan to sushi quite a bit, but today he had his first sushi roll. He made the biggest mess with it but really enjoyed it! 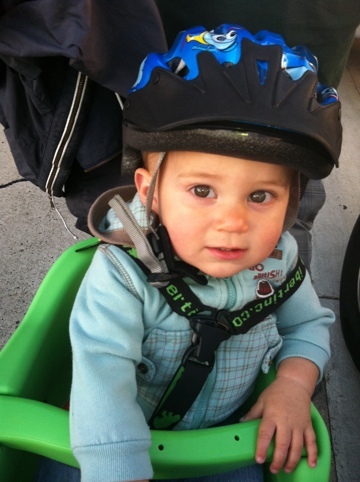 We also purchased the ibert child bicycle seat this week and took Ethan on his first bike ride. He really seemed to like it. It will be a nice way for us to get some exercise and enjoy the beautiful Long Beach summer weather. Jarrod and I are starting a 3 series cooking class tomorrow at Prep Kitchen in Seal Beach. I’m really excited and hope that we pick up some good tips that we can use in our daily cooking. Other than that, it should be a pretty uneventful week which will be nice.